The Celestant-Prime is the first Stormcast Eternal made by Sigmar, but has only been reanimated following the successful recovery of Ghal Maraz. Consequently, he is only now able to lead the Stormhosts into battle. Something of a Warhammer Frankenstein, then, among a whole legion of similar, the model is a little bit goofy, I can’t help but say. I love the actual body of the guy, his armour looks immense. 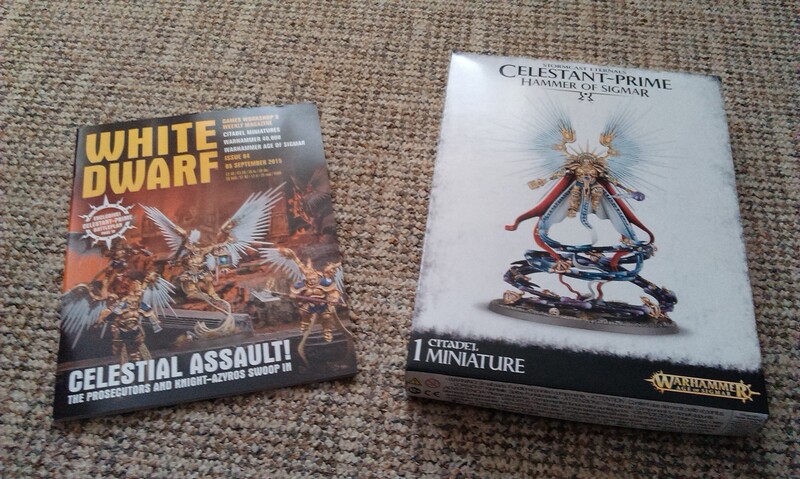 The wings I can kinda live with, as I love my Prosecutors, even if the Celestant-Prime makes them pale by comparison. The celestial orrery thing that swirls around his feet looks interesting, though could turn into a nightmare to paint. But the whole ensemble just looks faintly silly. Next weekend finally sees the release I’ve been waiting for, along with so many other exciting bits and pieces, I was eagerly refreshing the webstore this morning in a manner I haven’t seen since the End Times hardcover releases. First up, we’re finally getting the Prosecutor kits I’ve been dying to get my hands on! Only two different weapon options – paired warhammers as in the starter box, or javelin-and-shield combos that look super-awesome! The Prosecutor kit has a real good selection of other weapon choices, and it doesn’t take an eagle-eye to realise that most of them are recycled from earlier kits. The paired warhammers, okay those are the options in the starter set. We’ve also got something called a Stormcall Javelin, which is basically a shorter blade than the Stormstrike Glaive from the Paladin kit. 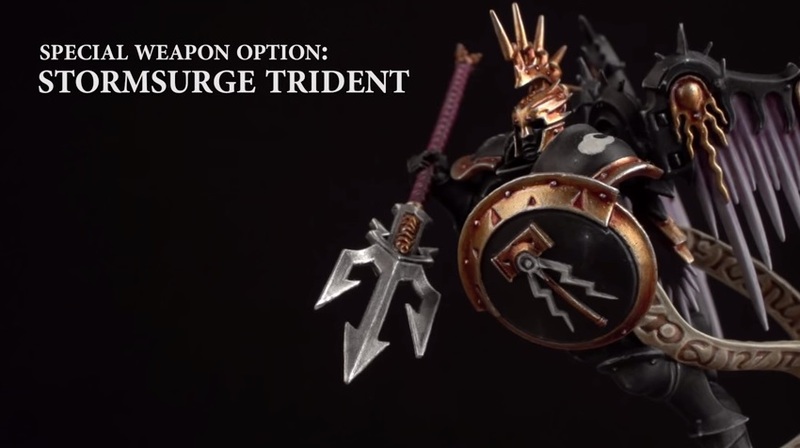 The special weapons are the Grandblade from the Liberator kit; the Grandaxe that is a Thunderaxe in the Paladin kit, and a Grandhammer that looks like that from the Liberator kit without the scroll hanging from it. There are also two separately-available character models with wings releasing (more shortly), one of which has a Judicator Skybolt Bow. I’m expecting all of this to lead to some disparaging remarks about design-laziness and the like, but it is actually addressed in this week’s White Dwarf as a fantastic way to swap out weapons among your units. See, the Prosecutors, Judicators and Liberators all have the same torso, so you can do all manner of customising on your guys to get a really interesting strike force going on. I’ve already mentioned the possibility of arming Liberators with the round shields; I’m also thinking I might give some Prosecutors a Liberator Warblade combo, and see where that takes me. It also means the army will have some really nice uniformity as it begins to come together. 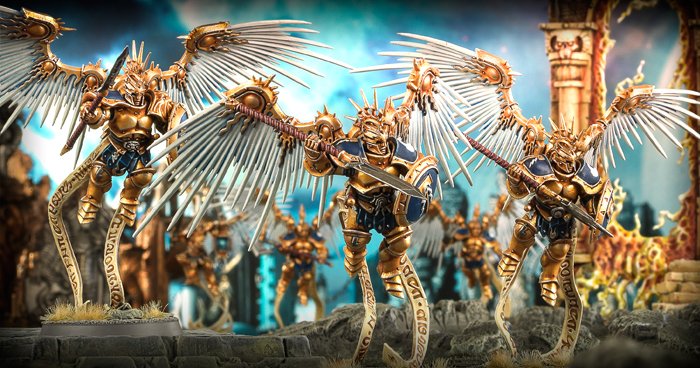 I think Prosecutors, with their massive wings going on there, are potentially the most weird unit released, and as such could look the most out-of-place in your army, but by adding this layer of uniformity, it helps to pull everyone together. So I’m a big fan! There are, as mentioned, two character models coming out next weekend: the Knight-Azyros and the Knight-Venator. These guys look amazing, and could be a lot of fun to build a unit of Prosecutors around, rather than just the Prosecutor-Prime. The Knight-Azyros wields a sword and lantern combo, and while the lantern of the Lord-Castellant is closed, this new iteration is open and blazing, with rules that allow you to sear every enemy within 8″ with the light of Sigmar. Nice! The Knight-Venator is something of a sniper model, using his Realmhunter’s Bow (a Judicator bow with some additional detailing) to strike from afar. He comes with a Star-eagle swooping low around his feet, which I feel is a really nice touch, though I have seen the odd comment online dismissing it. I think the model looks like a fantastic centrepiece-style kit, anyway, particularly when you see it in the colourscheme of the Celestial Vindicators, above. But that’s not all – we’re also getting Upgrade Kits! But that’s not all – we’re also getting an Army Book Codex Battletome! 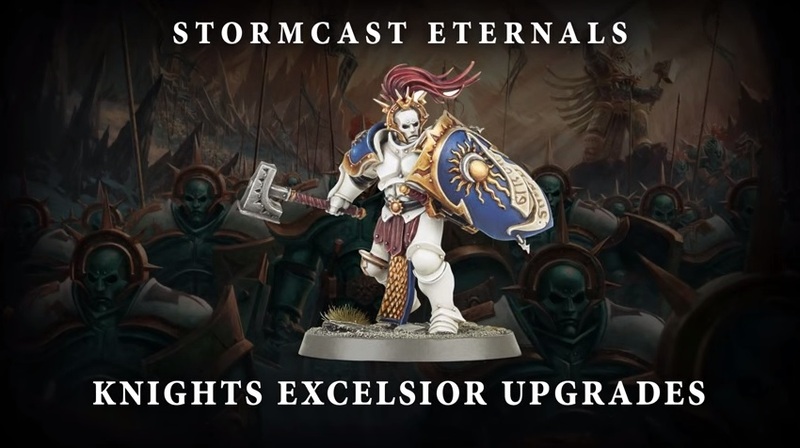 It’s also pretty exciting as I’m going to assume that it will be featuring all of the range of the Stormcast Eternals among its 17 warscrolls – so the end really must be in sight! A brief count puts the warscrolls we’ve had to date at 15, so paired with this week’s tease in White Dwarf, we can assume we’re getting just two more models and then the range will be complete. And my wallet can breathe a sigh of relief! The tease, incidentally, hints at a musician and a standard-bearer option for the Stormcast Eternals – presumably Liberator models – that has been floating around the internets for a few days or so now. 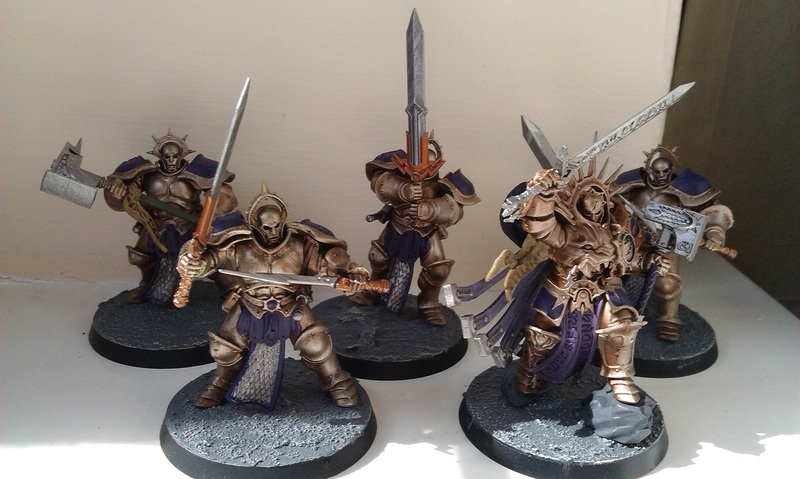 I’m excited to see the end of the Stormcast Eternal release window, which might sound a bit weird at first glance, but being a collector at heart, I’m excited to have some breathing space where I can finish building up my models, get them painted, and then see the entire war-host without thinking “there’s still x to get…” It’s been a whole shed-load of fun, and I’m excited for future releases down the line (I’m thinking next year, now), but for now, it’s really nice to think that my army will be very nearly done. No actual undercoat has been applied to these yet, though I am looking forward to trying something darker on the weapons this time. As with any army project I suppose, the more models you add to it, the more the scheme comes together, but the more everyone begins to look the same, so I feel a real need to make some stand-out differences where I can. Unfortunately I feel a bit like I’ve come up against a brick wall with the painting, having had two very productive weekends recently. Fatally, I tidied up the painting space in order to play a very exciting boardgame that is getting the first-look treatment on Tuesday, and I haven’t really been in the mood to put it all back to continue painting. Maybe in the next couple of days I’ll be inspired once more. For all of this, anyway, I am actually feeling very pleased with my Stormhost right now. 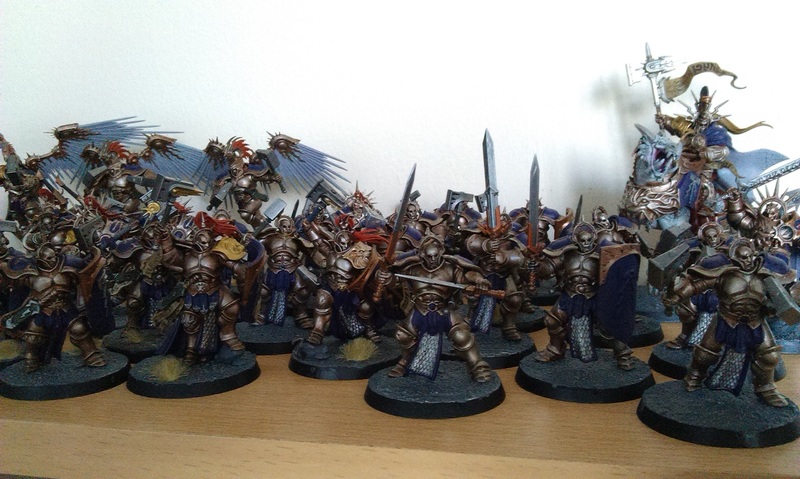 The Lions of Sigmar are steadily coming together, and I’m looking forward to finally trying the actual game out! But more than anything, I feel like all of this concentrated painting activity had really helped to hone my painting skills, and I’m feeling much more confident when I tackle the filigree bits like the raised detail on the pauldrons and shields. Progress with my Ogres hasn’t been as steady as I’d like, having been distracted by the Liberators last weekend, and I still have a sizeable number of Necrons waiting for something to finish them all off, so I definitely have my work cut out for me! Hopefully I’ll get everything finished off and beautiful over the course of the month, before my degree starts up again early in October and I’m back to having hobby-time somewhat curtailed.